Forget everything you know about turbocharged Civic hatchbacks being sleepers, because this 12 second Caprice Brougham will blow your socks off and then buy you a steak dinner. From the seller: "IS THERE ANYTHING ELSE MORE FUN THAN HAVING YOUR FRIENDS IN THE CAR WITH YOU AND SEEING THE FACE OF THE GUY IN THE CORVETTE, CAMARO, & MUSTANG DRIVERS (sic) YOU PASS BY ??" No, I'm pretty sure a 560-horsepower Grandpa mobile is the peak of fun no matter who you are. Find all-motor enjoyment in this 1986 Chevrolet Caprice Brougham sleeper for $9,989 in Madison, WI. For when you really need to get to bingo, this is your whip. A 383 stroker based on an SBC 350 replaces the 140-horsepower 4.3-liter V-6 or the 165-horsepower 5.0-liter V8. The build looks fantastically clean and includes a high-performance radiator, even though the 383 isn't known to overheat like some 400s are. It even has a column-shifted automatic so you can fumble with your post-cataract surgery sunglasses without being interrupted by a pesky redline. The Brougham package includes illuminated door sills, a vinyl roof, and other touches within the blue cloth interior. There's just the right amount of chrome. Really, everything works together to absolutely nail the Driving Miss Daisy look, right down to the wire wheels and tires that look better suited for wintering in Naples than trapping 114 in the quarter mile. We're not sure what dealer would pick up something like this, or what precedent they would use for pricing it. Where's the 12-second Caprice category in NADA? $10,000 seems fair for an unnecessary amount of power in a spotless, AARP-approved package. Whoever buys this better keep the stock charade going, although they're forgiven if they slap on a Reagan-Bush '84 sticker. Words by DT contributor slowcarSLOW-MPGlol. 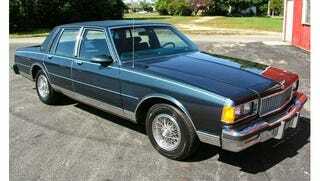 posted as 10k: 12-Sec Sleeper: 1986 Chevrolet Caprice Brougham on Daily Turismo. Photo credits, craigslist.